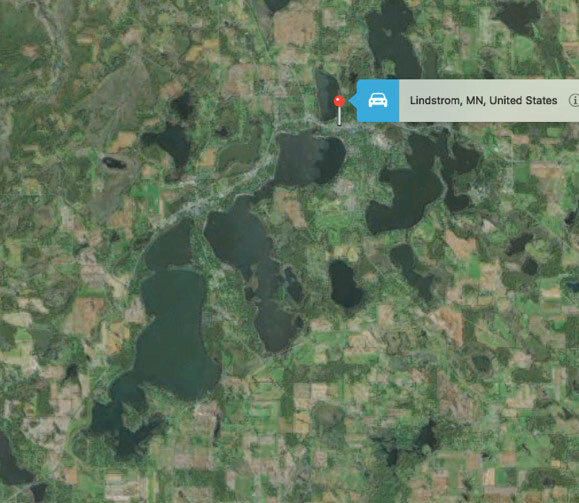 The Lindstrom exchange includes most of the area known as Chisago Lakes, a scenic area straddling US Highway 8, including the towns of Chisago City, Lindstrom, Center City and Shafer. 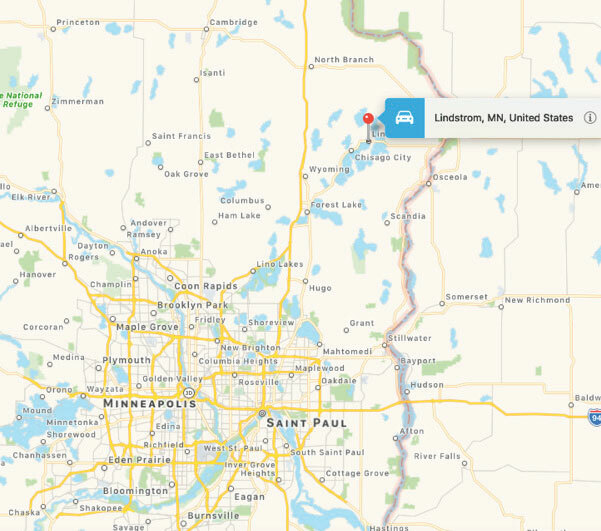 The community has a small-town or exurban feel with an excellent school system and easy access to Twin Cities metropolitan area work opportunities. The numerous lakes, wetlands, woods and small farms make living outside the boundaries of incorporated cities attractive. The rural residents are widely and generally evenly dispersed across the exchange with higher densities around the many recreational lakes. This satellite view highlights the geography of the region. 86% would make use of the Internet for all kinds of purposes if it was available. 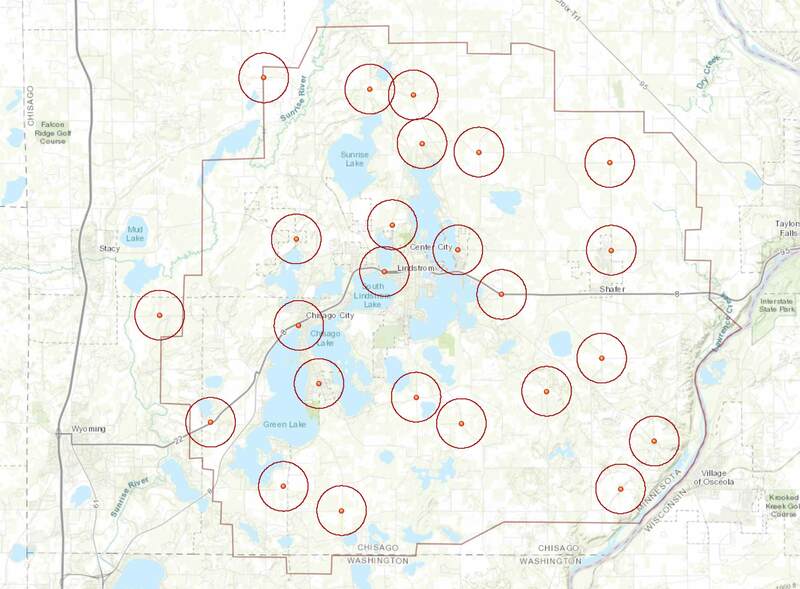 The map below illustrates the results of field examination of Frontier’s CAF II network deployment for the Lindstrom exchange (outlined on the map in grey). As described earlier, each dot represents an identified DSL Access Module (DSLAM). Each red circle has a 3,000-foot radius; blue circles have a 9,000-foot radius. 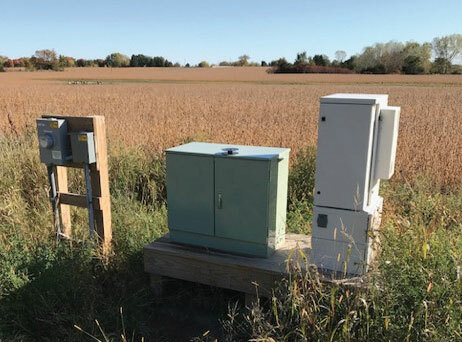 Each Frontier DSLAM connected by fiber optic cabling was verified based on the easily identifiable fiber optic cable pole markers consistently present. Frontier fiber was generally installed along each paved county road in the exchange. There are few unpaved roads in this exchange. For the most part, Frontier utilized a standardized equipment installation throughout the exchange as the picture here shows, with the DSLAM on the right, the cross-connect in the center and the power meter on the left. 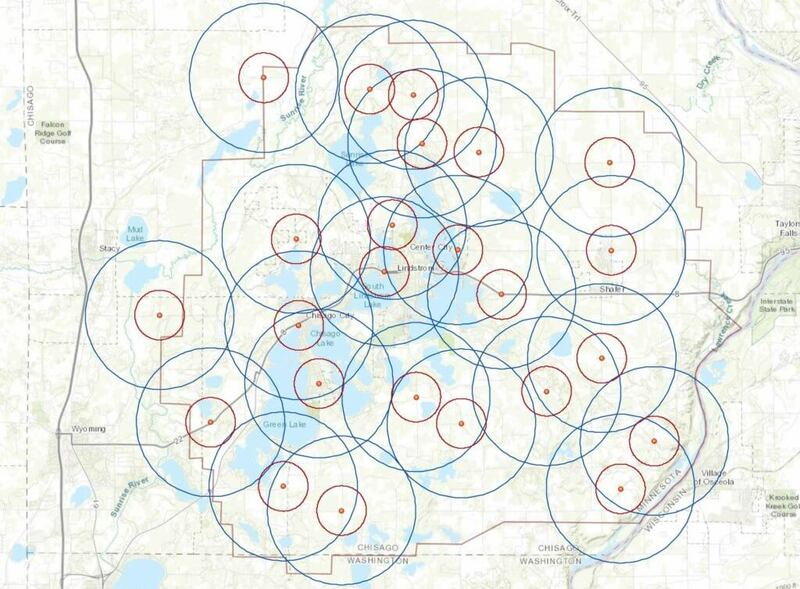 To illustrate the impact of CAF II investments towards meeting the 2022 state broadband goal of 25 Mbps/3 Mbps, the map below includes only the 3,000-foot radius circles. There is another prospective opportunity for vastly improved services – direct fiber connections – for those customers seeking higher levels of broadband services. This option – in this exchange or in future deployments by any provider – would be dependent on the proximity of the customer to the fiber routes and the provider’s network design. If handholes (which provide easy access to fiber underground in the same way a manhole provides access to tunnels under a road) were installed along the route between the nodes, especially at driveways leading to farms, rural businesses or higher-end homes, the provider would be able to offer solutions to customers with high demands for bandwidth and willingness to pay for installation and improved services. It should be noted that with fiber construction costs of $20,000 per milexvi, proximity to a handhole is critical. At this time, it is unknown if handholes were part of the network design. Industry experts consulted for this study also note that such subsequent enhancements would add operational complexity to the network ranging from electronics to technician training. Approximately 10 – 15 percent of the land area is within a 3,000-foot circle and thus capable of receiving 25 Mbps/3 Mbps or better. There are relatively few areas in this exchange that are outside of the 9,000-foot radius circles where available service is likely to be less than 10 Mbps/1 Mbps. Most of the land within the exchange is within a 9,000-foot circle, but outside of a 3,000-foot circle, indicating that for most customers, broadband service availability would be between 10 Mbps/1 Mbps and 25 Mbps/3 Mbps.